I just love the whole “You’ve been elfed (or jingled, or whatever) thing.” At Halloween time we do the “You’ve been booed” thing with our neighbors and then at work. It’s fun. The kids love it. And who am I kidding, I love it. I love walking out on the front porch and seeing a treat for me and my kids. It brings great joy to my life. The other day it occurred to me that it’s almost December. Wait, perhaps I didn’t have the correct amount of emotion in that statement… IT’S ALMOST DECEMBER!!!! I’m both scared and super excited by that. So it’s almost time to start elfing (or jingling or whatever you chose to call it.) And I found some great printables on the internet. I mean really, hasn’t everyone heard the expression “why reinvent the wheel?? ?” So I’m going to share them with you. Enjoy! And get cracking! It’s almost December!!! 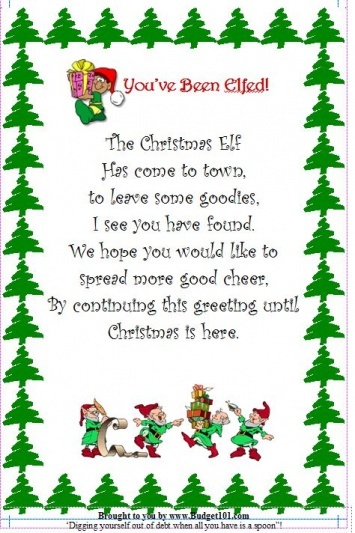 This site explains about being “jingled” and has some great printables. I found a great site that has 52 gift ideas that are simple and inexpensive. 52!!! Head on over to Brassy Apple and see what they are up to. I’m linking to the great linky parties on my sidebar! These are some keepers, thanks Erin! These are great! Thanks so much for sharing with us. Coming over from Tuesday Time Out. I love your blog even if all my kids and grandkids are all grown up. You have some great ideas. Great printables! Would love for you to share at our Shine on Friday party going on now. Great post! I featured it at our Shine on Friday party today. We hope you’ll join us again today. I really like this posting and the cards. The ideas for the gift are so darn cute. This is a page I will be forwarding to people I know . I know they will enjoy it to. Thanks so much. Forgive me for reposting old projects but we’re still not baking much around here and these ideas were so much fun. Check them out if you missed them! Octo Dogs and ShellsAn Alien Invasion For DinnerHot Dog CookiesWatermelon BeetleMeatloaf & Mashed Potato CupcakesSloppy Joe Race Cars Have fun with your meal!